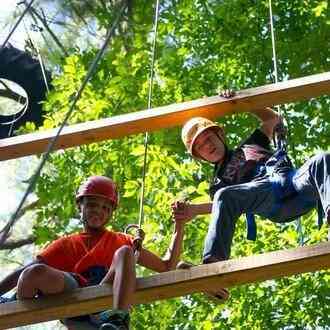 The Silver Lake Conference Center Share the Adventure Campaign is an effort to raise $120,000 to build a new high ropes course at Silver Lake Conference Center so that conferees and retreat groups can enjoy it starting in Summer 2018. We have secured $40,000 toward our goal and are in talks with donors to raise another $60,000. We need the Silver Lake Community's support to raise the final $20,000. On behalf of everyone at Silver Lake, we hope that you are enjoying the start of winter and the Christmas season. Snow has fallen at camp and while we do not have many guests right now, things are very busy as we prepare for the 2018 summer season. We want to tell you about an exciting new project that will be a great new addition to the summer – the building of a new high ropes course for Silver Lake. As you know, the low and high ropes courses are an integral part of programming both for retreat season guests and summer conferees. Our current low ropes course remains in great shape and will serve us well for years to come, and our high ropes course has served us well for more than a decade. However, due to a variety of factors, it has been determined that several of the elements in the current high ropes course can no longer safely be used and that the most cost effective solution is to build a new course at a different site on campus. 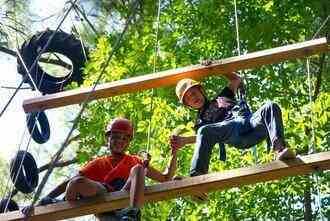 A committee of key Silver Lake staff and board members has worked with High Five, a challenge course design-build firm for almost a year, to identify a new site and select the elements to be included. We are happy to report construction has already started and we have launched the Share the Adventure Campaign – a fundraising campaign with a goal of $120,000 to fund the new course. The new high ropes course will include multiple elements that can only be completed with the assistance of your team, allowing 15-20 participants to be actively engaged in the course as compared to the current design, which only allows for 3-4. In addition to retreat guests and campers using the new course, we believe that local community groups, schools, and businesses will also use the course, increasing Silver Lake’s relationships in the local community. The total goal for the Share the Adventure Campaign is $120,000, of which we have secured $40,000 and are in talks with donors to raise another $60,000. We need the broader Silver Lake Community to help us raise the final $20,000. To ensure that the course will be ready for summer 2018, the Connecticut Conference has generously advanced Silver Lake the funds to complete the building phase. Your support is needed to ensure that funds are not diverted from other needs to cover this necessary improvement. I am helping to support Silver Lake Conference Center. This is an important cause and I’d really appreciate your help. Please spread the word and/or make a donation. Thank you so much! I just made a donation to "Silver Lake Conference Center." Please help me spread the word about this cause or make a donation yourself. Your generous donation goes directly to Silver Lake Conference Center, less credit card processing fees. GivingGrid.com does not take a fee from Silver Lake Conference Center. Please help a little more to support GivingGrid's operating expenses and keep the service free to Silver Lake Conference Center. Why? Unlike most other services, we don't charge Silver Lake Conference Center any fees. It's free to them.